This well-known dry goods house has been established and doing business in London for nearly six years. It was founded by Mr. Johnstin and Miss Van Wagener, but about five years ago, the present firm, consisting of H. H. Johnstin, Sara Van Wagener and E. F. West, was organized, all of whom have had a wide experience in all the various departments of the dry goods business. 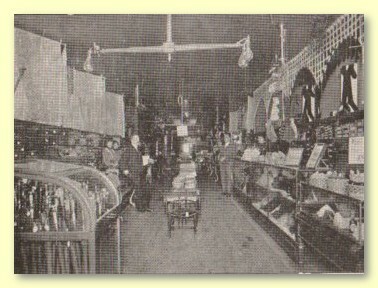 They occupy one of the finest and most commodous stores in this section, in which they carry an infinite variety of goods, such as cloaks, suits, staple and fancy articles, carpets, rugs, draperies, linoleums, wall paper, ready-to-wear garments and indeed everything usually found in a first class emporium. A liberal policy, courteous treatment, the tact and taste to have the right thing at the right time for the right purchaser at the right price, have conspired to give this firm not only a large trade, but a high standing in the county. Their goods are reliable and the customer is guaranteed satisfaction. This is the oldest dry goods firm in the city and has proven to be "London's Leaders."